Last week the kids and I went blueberry picking along with their cousins. After spending forty-five minutes picking berries as if it were an Olympic sport, we left the farm with honey sticks and large bags of blueberries. With visiting family staying with us this week, Abigail wanted to surprise them with a homemade blueberry pie. Selfishly though, I convinced her into making a blueberry crisp instead. I don’t know why but I’ve always preferred berry crisps over pie. Perhaps it’s the top layer of crunchy oat topping which complements the sweetened cooked fruit underneath. Truthfully though, at the time we were discussing which one to make, my strong preference for crisp and my lack of enthusiasm for pie, was the only justification I needed to sway Abbi. The end result was AMAZING. Please make this crisp. Soon. With a scoop of vanilla ice cream. For anyone who has been following my health saga, I’ll talk about it more later this week. Things are improving, thank goodness. 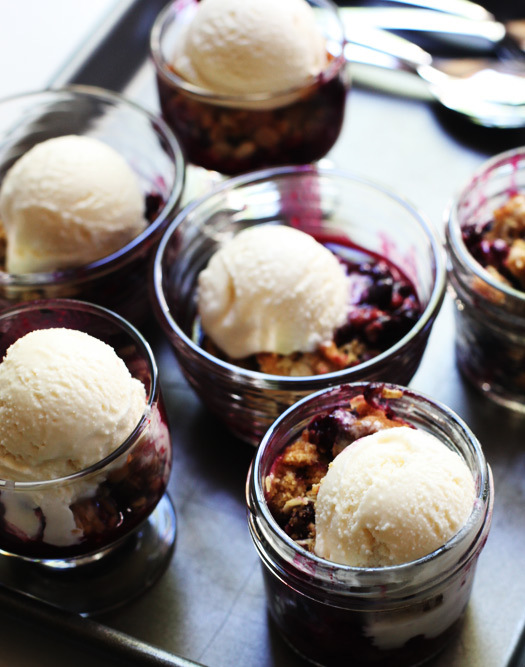 But for right now, I will leave you with this recipe for homemade blueberry crisp. Enjoy! PS: The recipe for homemade vanilla ice cream is coming tomorrow. No eggs needed and only a few ingredients required! A simple and delicious summer dessert. Spray a 9x13-inch baking dish with non-stick spray. In a large bowl, mix the sugar and flour. Add the blueberries and lemon juice and gently toss with the sugar. Transfer the blueberries to the prepared baking dish. In a food processor, add the flour, brown sugar, and butter and pulse the ingredients until it resembles coarse meal. If you don’t have a food processor, work the mixture with your fingers by rubbing the ingredients between your thumb, fingers. Place the mixture in a large sealable plastic bag. Add the oats, cinnamon, and salt. Mix all the ingredients by sealing the bag and shaking it for a few seconds. Evenly sprinkle the mixture over the berries. Bake for 45 minutes or until the topping is slightly brown. Serve the crisp hot or cold with a scoop of vanilla ice cream. there’s a mistake in the recipe. if you are mixing the sugar and flour in a bowl but then just tossing the blueberries with the sugar how is that possible if you have already mixed the flour and sugar? Hello I made this Crisp last weekend with my granddaughter and my family loved it! Can I use the same base recipe with peaches? If so How many pounds and do I need to peel peaches? Please let me know of any adjustments. Thanks for a wonderful recipe! Glad you liked it Ruth! I decided this would be much easier than a Blueberry Pie, Not only was this easier, It was Delicious! also a desert you’d be proud to serve for company! Thanks for making my life a little easier! Ohh yum, looks fab but it what I would call a Crumble over here in the UK. Just stopping by to say hi from #ONEMums. Oh my god that looks amazing. That looks like the kind of pudding I’d make, then tell everyone it burnt in the oven so I got to eat it all to myself. Just gorgeous! I think blueberry crisp is by far the most beautiful of the “crisps”! I made this last night and OMG! Soooo delicious!!! A must for any blueberry lover… but several other fruits would work well too! anxious to try peaches or apples! ohh the colour of blueberries.. love it.. wish we got them easily in india!! waiting for the eggless vanilla ice cream recipe!! Wow!!! That looks and sounds stunning. Thanks for sharing this lovely recipe. Mmmmm I want this right now!! I have a TON of blackberries right now, I’ll try it with them! This looks so awesome! 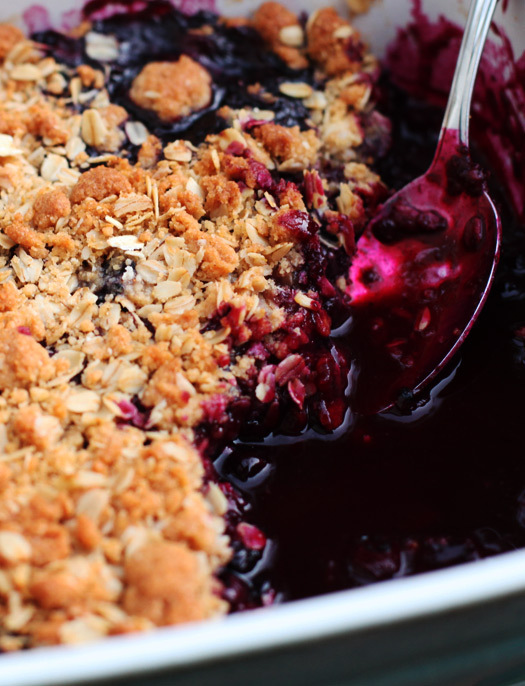 I haven’t made a blueberry crisp before, but now I simply MUST! i want this right now!!! i’m so excited to try this as we planted blueberry bushes in our backyard this summer that are producing! !